This is a fun and simple birthday card! It’s also one of the cards from the November Make and Take. For this fun and quick card I started off with a piece of Summer Starfruit card stock cut at 5-1/2” x 8-1/2” and scored at 4-1/4”. Next I cut a piece of Whisper White card stock 3-7/8” x 5-1/8”. I stamped the circle images from Circle Circus onto the center of the card stock in Summer Starfruit, Basic Gray, and Baja Breeze ink. I adhered this onto a 4” x 5-1/4” piece of Basic Gray card stock and adhered it onto the card front. 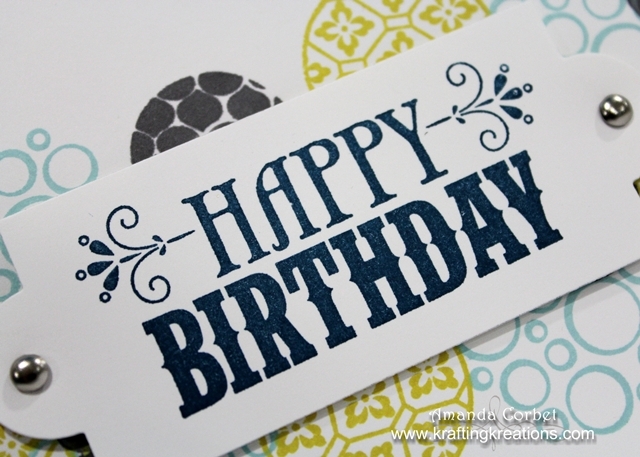 Next I stamped the Happy Birthday greeting onto a scrap of Whisper White card stock in Midnight Muse ink. This is one of the stamp sets that you can buy individually, and it fits so perfectly inside this label! Then I cut out the greeting with the Apothecary Accents Framelits. I used my Paper Piercer and Stampin’ Pierce mat to pierce a hole in each end of the label and added a Silver brad in each hole. 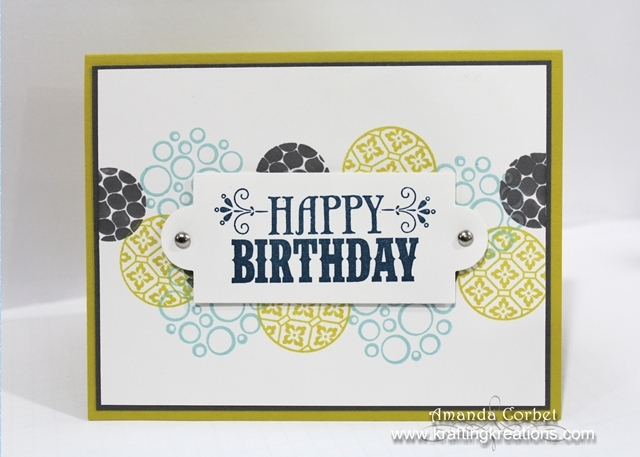 I adhered the label onto the card front with a couple Stampin’ Dimensionals. That is all it took for this fabulously quick and easy birthday card!